I was born in 1960, and live in Burgdorf, Switzterland. I got my high-school diploma in Math and Science, and then graduated from the University of St. Gallen in Business administration. Today, I run my own company in the food-industrie and logistic, and have some management duties in other industrie-organisations. On January 13, 1969, a Swiss magazine published spectaluar pictures of Apollo 8, the first manned flight to the moon. Right at that moment, my interest in spaceflight was awakened. Also, I was inspired by the expert commentator on all the TV broadcasts about Apollo we had in Switzerland. That was Dr. Bruno Stanek (today a personal friend), who is for Switzerland what Carl Sagan was for the USA. These two factors definitely excited my enthusiasm for spaceflight. For more than 40 years now, I have been collecting all sorts of space-related books, DVD's, models, replicas, flown items, historical newspapers and so on. I had the chance to travel within Europe and to several places in the USA, Russia, Baykonur, Japan and Kourou, to visit rocket-factories, space-museums, launches and landings of spaceships. I am member of the Swiss Space Association, Pro ISSI, and Deutsche Raumfahrtausstellung Morgenröthe Rautenkranz e.V.. Sometimes, I contribute to space education by giving talks, writing articles, or lending items to exhibitions or museums. I am proud to have met six of the moonwalkers and to be a witness of this historical time, when mankind makes the first steps into space. Most importantly, I am grateful to have a wonderful wife, Rita, who gives me the freedom to follow my passion for spaceflight. 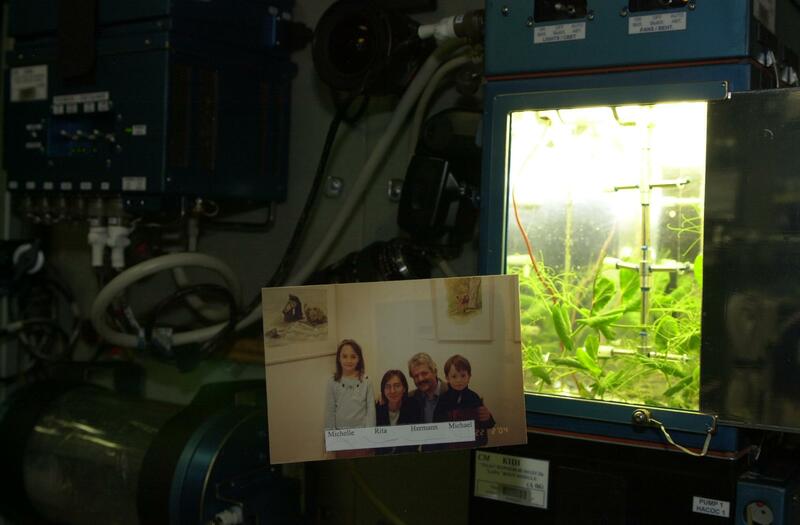 This is a picture of a picture of my family - IN SPACE ! The picture (click on it for a larger version) includes a) the faces, b) the names, and c) a hair (with the whole DNA) of each family-member. - Cosmonaut G. Padalka brought the photo to the International Space Station (ISS), took the picture of my free-floating family in the Zwesda-module in front of the greenhouse, and, after his return to earth, sent the original photo back to me in Switzerland.